, an English divine, of whom some account may be acceptable, preparatory to that of his more celebrated son, was the son of a nonconformist minister, ejected in 1662. He was born about 1662. He was educated in nonconformist sentiments, which he soon relinquished, owing to the violent prejudices of some of his sect in favour of the murder of Charles I. 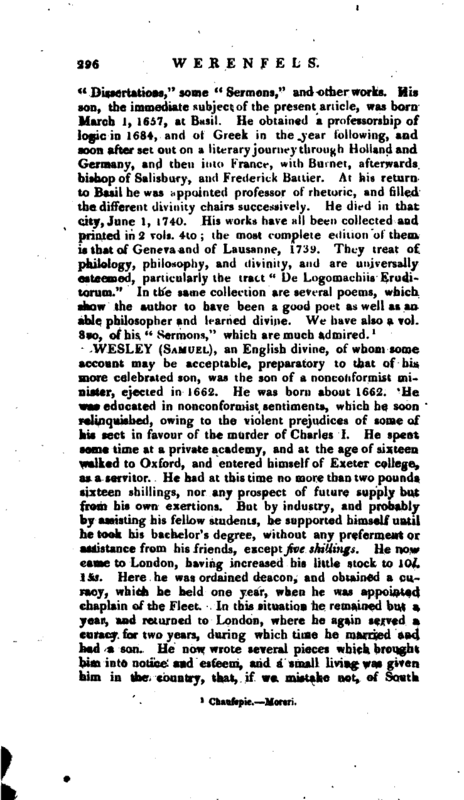 He spent some time at a private academy, and at the age of sixteen walked to Oxford, and entered himself of Exeter college, as a servitor. He had at this time no mure than two pounds sixteen shillings, nor any prospect of ‘future supply but from his own exertions. But by industry, and probably by assisting his fellow students, he supported himself until he took his bachelor’s degree, without any preferment or assistance from ^his friends, except five shillings. He now came to London, having increased his little stock to 10l. 15s. Here he was ordained deacon, and obtained a curacy, which he held one year, when he was appointed chaplain of the Fleet. In this situation he remained but a year, and returned to London, where he again served a curacy for two years, during which time he married and had a son. He now wrote several pieces which brought him into notice and esteem, and a small living was given him in the country, that, if we mistake not, of South | Ormesby, in the county of Lincoln. He was strongly solicited by the friends of James II. to support the measures of the court in favour of popery, with promises of preferment if he would comply with the king’s desire. But he absolutely refused to read the king’s declaration; and though surrounded with courtiers, soldiers, and informers, he preached a bold and pointed discourse against it, from Daniel iii. 17, 18. “If it be so, our God whom we serve is able to deliver us from the burning fiery furnace, and he will deliver us out of thine hand, O king. But if not, be it known unto thee, O king, that we will not serve thy gods, nor worship the golden image which thou hast set up.” When the revolution took place he wrote a work in defence of it, dedicated to queen Mary, who, in consequence of it, gave him the living of Epworth, in Lincolnshire, about 1693; and in 1723 he was presented to the living of Wroote, in the same county, in addition to Epworth, which last he held upwards of forty years. In the beginning of 1705 he printed a poem on the battle of Blenheim, with which the duke of Marlborough was so well pleased, that he made him chaplain to colonel Lepelle’s regiment, which was to remain in England some time. In consequence of the same poem, a noble lord sent for him to London, promising to procure him a prebend; but unhappily he was at this time engaged in a controversy with the dissenters, who being in favour at queen Anne’s court, and in parliament, had influence enough to obstruct his promotion, and even to procure his removal from the chaplaincy of the regiment. As a parish priest he was very exemplary in the discharge of his duties, which did not, however, divert him from literary pursuits, the most serious of which was the study of the scriptures in the original languages. 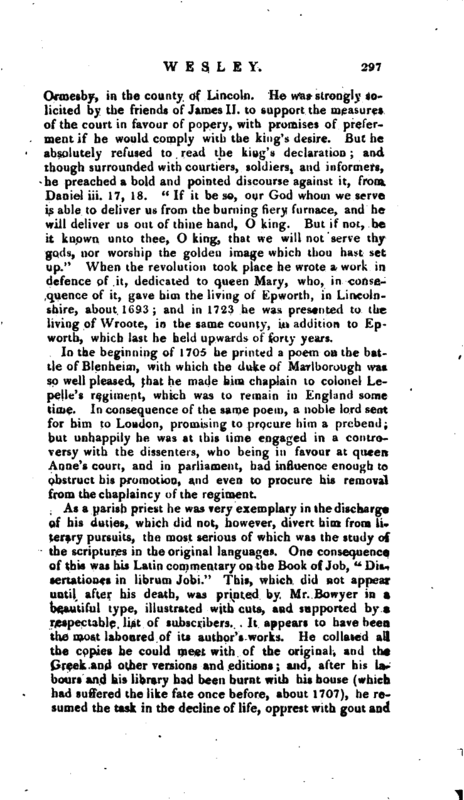 One consequence of this was his Latin commentary on the Book of Job, “Dissertationes in librum Jobi.” This, which did not appear until after his death, was printed by Mr. Bowyer in a beautiful type, illustrated with cuts, and supported by a respectable list of subscribers. It appears to have been the most laboured of its author’s works. He collated all the copies he could meet with of the original, and the Greek and otjier versions and editions; and, after his labours and his library had been burnt with his house (which had suffered the like fate once before, about 1707), he resumed the task in the decline of life, opprest with gout and | palsy through long habit of study. Among other assistances, he particularly acknowledges that of his three sons, and his friend Maurice Johnson. 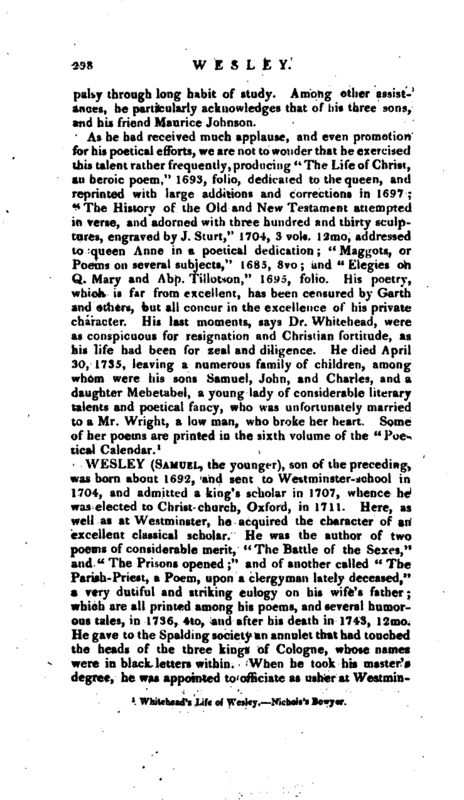 Whitehead’s Life of Wesley. Nichols’s Bowyer.